MLB manager who helped the Chicago Cubs break their 100-plus year curse by winning the 2016 World Series in seven games over the Cleveland Indians. 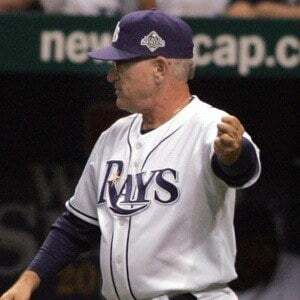 He was named American League Manager of the Year in 2008 and 2011 during his time with the Tampa Bay Rays. He played baseball and football at Lafayette College. He won a World Series ring as a bench coach for the Anaheim Angels in 2002. He has children named Sarah and Joey with his ex-wife Betty. He married Jaye Maddon in 2008. He coached pitcher David Price to an AL Cy Young Award in 2012.